How often have you been in your tree stand searching your pockets looking for the right can-call or blindly fumbling to reach the binoculars in your backpack? Are there days you wish you had an extra bottle of water or a few extra arrows with you in-stand? Do you dislike having to wear all of your calls and optics around your neck? Have you ever dropped gear that was in a back-pack because that zipper wasn’t quite closed? Do you wish your tree stand configuration was as organized as the tools in your garage? Welcome to the Timber Locker™ storage unit. 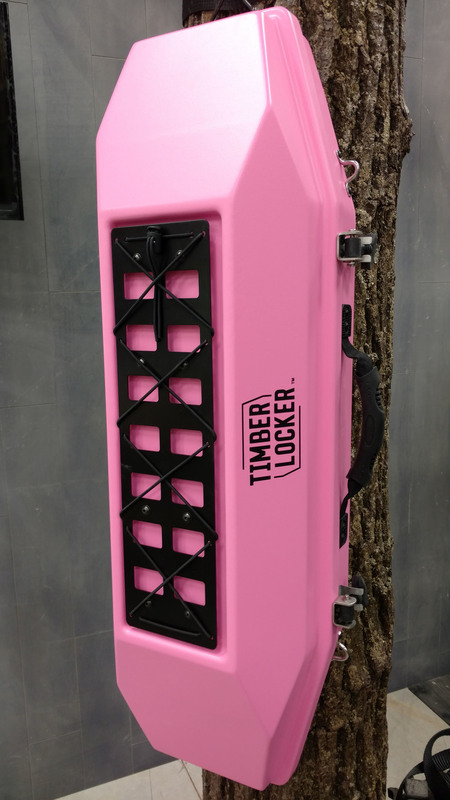 Unlike a soft back-pack, the Timber Locker is a secure, water-proof, and scent-containing organizational system that stays in the tree in which you hunt from. The Timber Locker ™ storage unit is a game changer, so much so, that it has design and utility patents pending! Made from premium materials, the Timber Locker ™ is meant to be a once in a life-time purchase. It’s customizable, using a platform designed for military applications. This tactical system has a place for everything, so you can keep everything in its place. The Timber Locker ™ storage unit saves time, protects your gear, reduces noise, shields unwanted scent, and is made to last the test of time. A plethora of uses exist beyond the deer season. The Timber Locker ™ storage unit can be used in the fall duck blind, along a spring trout stream, to house gear as you blaze the summer ATV trails, and even to hold your ice fishing rods in the dead of winter. Buy the Timber Locker ™ today; you and your children’s children will appreciate your quality investment. The Timber Locker ™ storage unit was designed and built to withstand the abusive conditions that are found in the woods. Wind, snow, varmints, and pouring rain don’t stand a chance against the Fiberglass Reinforced Plastic (FRP) outer shell. The Timber Locker ™ storage unit originated with one core principle – maximizing a hunter’s time in the woods. This is not a backpack, it is a storage locker – meant to stay in the tree with your stand. The Timber Locker ™ storage unit provides an organized, efficient, and customizable storage configuration that is quiet, water-proof, and scent containing. Premium components have been selected – including: impact-resistant fiberglass, torque-limited hinges, stainless steel hardware, UV-resistant hasps, power-coated steel MOLLE panels. Utility has been engineered and designed into this system which has patents pending. The Timber Locker ™ storage unit can be used in a right or left-handed configuration, and is meant to stay in the tree – for the night, or for the season. The Timber Locker ™ storage unit has been designed to fit on an ATV, to be worn on your back, and hold the gear used by most hunters. Where extra minutes in the woods count, The Timber Locker ™ storage unit is there to streamline your hunting experience. Like all Mekco Outdoors product, the Timber Locker ™ storage unit is made with American pride in the great state of Wisconsin. This kit allows you to move your Timber Locker™ storage unit with you. Simply place this system in each tree that you hunt from to keep your transition time quiet and efficient.